Sian, is at times called “The Duchess”, and because of her larger than life presence, we’ll call her that. The Duchess has a constant smile on her face and that joie de vivre that we only wish we have for ourselves. I bet, everyone wants to be her friend and us Taclobanons are most grateful for her advocacy and her efforts for gracing us with her hard work and efforts in helping to rebuild our community. LL: Sian, (pronounced ‘Sean') you have an unusual name, where does it come from? LL: And your last name? LL: Those two heritage of yours are pretty strong. SM: Yeah, yes they are! LL: Can you describe where you come from? SM: I come from Brighton, it's like London by the sea, it’s young, vibrant, lots of clubs, bars. It’s a fun place to be. There’s no place I’d rather live in England. SM: I’ve been traveling for 2 years now, I worked in farms in Australia, a banana farm, worked in a cattle station and in a farm for beans where I washed the green beans. LL: So, what’s your impression of our place? SM: I love Tacloban, I love the Philippines, people are friendly and loving all the time, I feel like I’m Lady Gaga (laughs), because there’s not a lot of white people here. After the horrible disaster, people are still very happy, they have managed to build up. SM: I’ve volunteered for charities in the past in England. Helping out elderly people, there is a program there where they pair you with old people who cannot go out and you spend time with them. I have this older woman I visited and we have become best friends she’s so lovely I’d sit and talk to her, she would love it. I’ve been away for 2 years now so I e-mail her and her son reads the letters to her. A friend of mine introduced me to All Hands and that’s how I got to volunteer. SM: In the western world we are just all consumers and we waste too much, we don’t need all the things that we have, yet, people here don’t even have a bathroom or a bed, but are still happy. The kids play this game where they hit cans with their flip flops and they are more happy. Kids in the west have things like iPhones, video games and so on. LL: I am happy that we have that impression on foreigners, and since nobody is perfect, what are the ways you think we can improve? I myself realize that a lot of garbage is thrown all over the place. SM: Yeah, there are trash all around. LL: Are you an activist or an advocate? LL: Given all that has happened in the world, the news we see, the political and religious wars between countries, ideologies, there’s terrorism and the natural disasters which we cannot control. Do you feel there is hope for the future of our planet? SM: Yeah! we always come back, I mean look at this place, this is an example. SM: Terrorism, it’s a big problem. I mean why would you kill? SM: Fiction stories mainly, I write fiction stories, mostly about dreams. I write a journal at times, my dreams give me ideas for things to write. SM: I will keep traveling, I am going to Hong Kong, and I want to go back to Australia. I also want to help with all Hands in Detroit (Michigan), there has been bad flooding there. Next year I plan to live in Germany. LL: I have a few one-word-answer questions I want to ask you, you must choose one answer from the choices and you are not allowed to explain why. Shall we have a go at it? Coffee or Tea? Dahling, I drink nothing but tea! Obviously, The Duchess is the quintessential modern English girl, she has claimed royalty, awesome hair, loves tea and has a free spirit. As Sian heads to her succeeding adventure beginning tomorrow, we are thankful for all that she has done for us, we are touched by that exuberant life that emanates from her. I can also see that her life may be more interesting than so many of the fiction books we read. 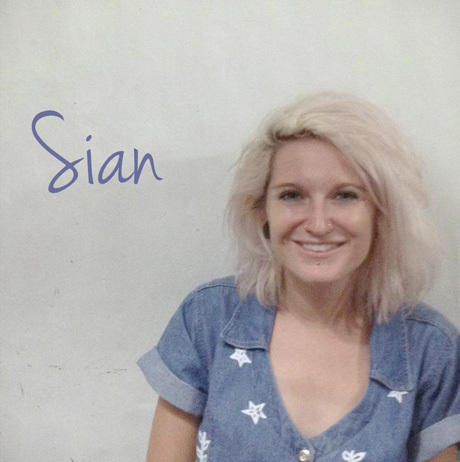 Sian, from all of us, thank you.